Off-peak is when demand for electricity is lowest; it costs 6.5/kWh. Mid-peak is when demand for electricity is moderate; it costs 9.4/kWh. On-peak is when demand is highest; it costs 13.2/kWh. People use electricity differently throughout the year. The Ontario Energy Board has therefore created two sets of peak prices, which apply only to weekdays. Electricity is at its cheapest price on weekends and holidays all day throughout the year. For more information, please visit The Ontario Energy Board. May 1 – October 31 In Summer, electricity use peaks during the hottest part of the afternoon, when air conditioners are running on high. 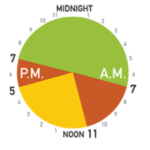 On-peak hours are mid-day. 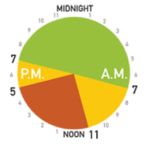 November 1 – April 30 In Winter, less daylight means electricity use peaks twice: once in the morning when people wake up and turn on their lights and appliances, then again when people get home from work. There are two sets of on-peak hours to reflect this.